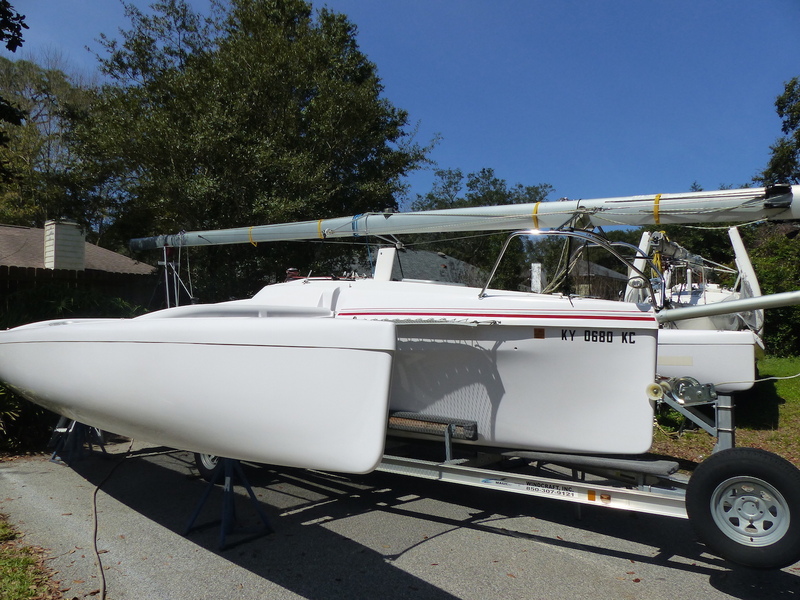 2003 power catamaran for sale. SkeeterCat 33, a 2003 power catamaran of advanced design was designed and built to achieve the most fuel efficient, seaworthy and comfortable vessel possible for cruising and fishing–both offshore and on the flats. Her wave-piercing bows slice through ocean waves easily, providing an exceptionally smooth ride. Constructed of space-age composite materials, with five buoyancy chambers and a crash compartment in each hull, she is virtually unsinkable. Kevlar 49 reinforced hull bottoms allow the SkeeterCat to glide through shallows and safely beach on her hulls. SkeeterCat is easily trailerable to reach distant destinations quickly–a road trailer is included. SkeeterCat is the perfect vessel for fast and comfortable trips to the Bahamas without burning thousands of gallons of fuel. SkeeterCat 33 is the most modern hull design that was built to test a new concept for a larger diesel-powered production model. 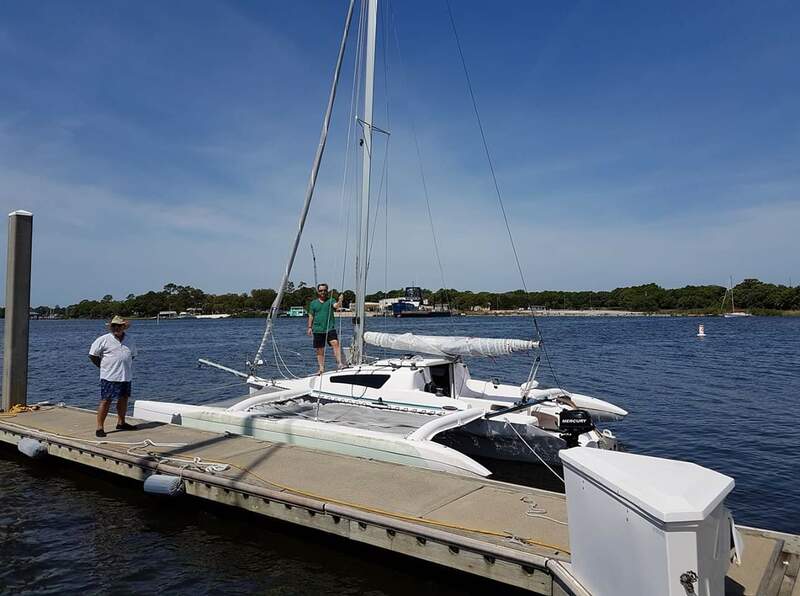 This boat has gone through extensive sea trials (logged over 5000 miles), two propulsion systems and other modifications to achieve the most fuel efficient, practical and comfortable power catamaran for cruising and fishing–offshore and flats!Exceptional fuel efficiency of 3.25 MPG at 4000 RPM / 18.4 MPH! At trawling speed, consumption is less than 1.0 GPH! Top speed is 25 MPH. To understand why this design is so radically different and why it is so efficient, you have to understand the concept behind the design.Weight is the most crucial element in producing an efficient vessel. Weight determines the hull shape, how much water the vessel displaces, amount of vetted surface, wave making and all these factors create resistance. Heavy boats need wide hulls and blunt bows to support all the weight. These shapes plow the water and that consumes a tremendous amount of wasted energy. When colliding with a large wave, it’s like hitting a wall that practically stops the boat. For this type of vessel, it is necessary to use a large propulsion system to overpower this large resistance force to maintain a steady speed.SkeeterCat’s slender hulls and wave-piercing bows just cut through the water and waves like a knife, drastically reducing impact loading, wave-making, stress on the structure, and creates an exceptionally smooth ride. 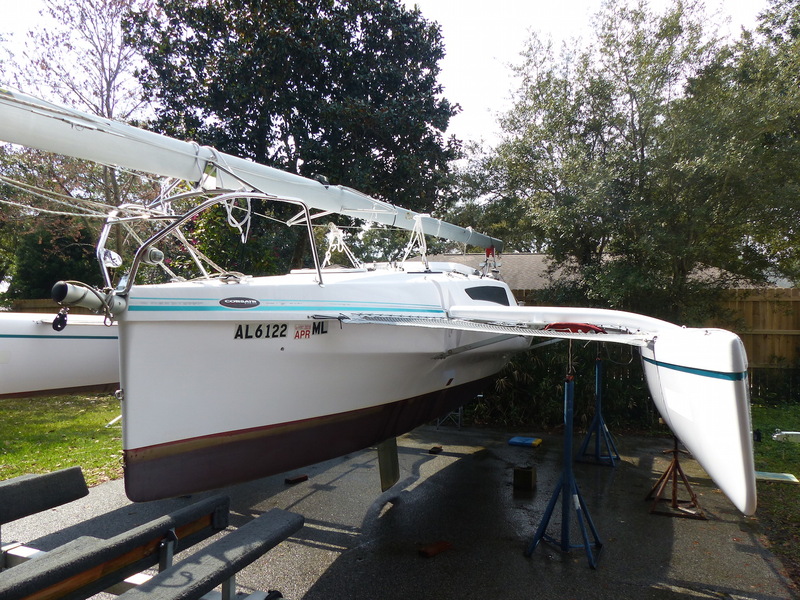 These hulls are very easily driven, so it can maintain her cruising speed with much smaller engines. This boat does not create a wake like conventional boats. When you see a huge wake behind a vessel, that is all wasted energy. It is gross inefficiency that creates shore erosion and wake damage in marinas!Simple Question: What floats better–a piece of bamboo or a heavy hardwood log ballasted with a bunch of bricks? This is a good comparison between SkeeterCat and conventional production power boats. Traditionalists will say, “for offshore it must be built heavy duty and strong.” Building heavy does not necessarily mean strong. Heavy boats will fight the elements, have more stress loads and slower recovery when driven under in large waves. Heavy boats use a lot more raw materials in construction. Modern composite construction is light and super strong. SkeeterCat is built with the same materials as Space X shuttle! Hull construction: CoreCell, ProSet Epoxy, vacuum bagged, outside skin QuadX cloth; double on bottom with Kevlar 49 in the laminate, TriX inside with 10 oz. satin cove; Awlgrip paint. Another very important boat design feature is SAFETY! Heavy boats sink if holed! 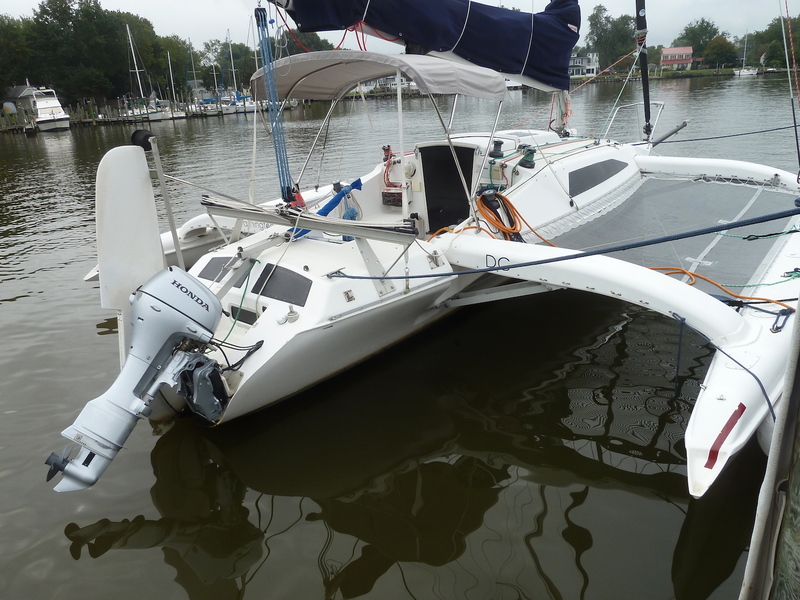 By using crash bulkheads and buoyancy chambers throughout the hulls, this major problem can be avoided. SkeeterCat has FIVE buoyancy chambers in EACH HULL, with crash compartments in bow and stern. Kevlar 49 is laminated into the hull up to the waterline for puncture resistance. If all boats would use this simple solution, it would save on insurance costs and avoid the environmental damage caused by fuel and oil spilling when a vessel sinks. In my opinion, this safety feature should be mandatory on all boats! SkeeterCat 33 offers 20 advanced design features that no other similar sized vessels have. Fuel efficiency 3x better than similar sized vessels. Eco-Friendly–3x smaller &ldquocarbon footprint&rdquo than similar sized vessels. Weight is one quarter of similar sized vessels, with state-of-the-art composite construction. Light displacement requires smaller propulsion system; saving on engine costs, fuel tanksize and fuel costs. Light displacement has less stress loads, more buoyancy and faster recovery in big waves. Kevlar 49 laminate in the bottom of the hulls making them virtually unsinkable. The Wave-Piercing Hulls and light displacement create no wakes, avoiding shore erosion. Wave-Piercing Hulls and advanced hull shape, cut through the waves instead of riding over and/or plowing into them, creating a much smoother ride. 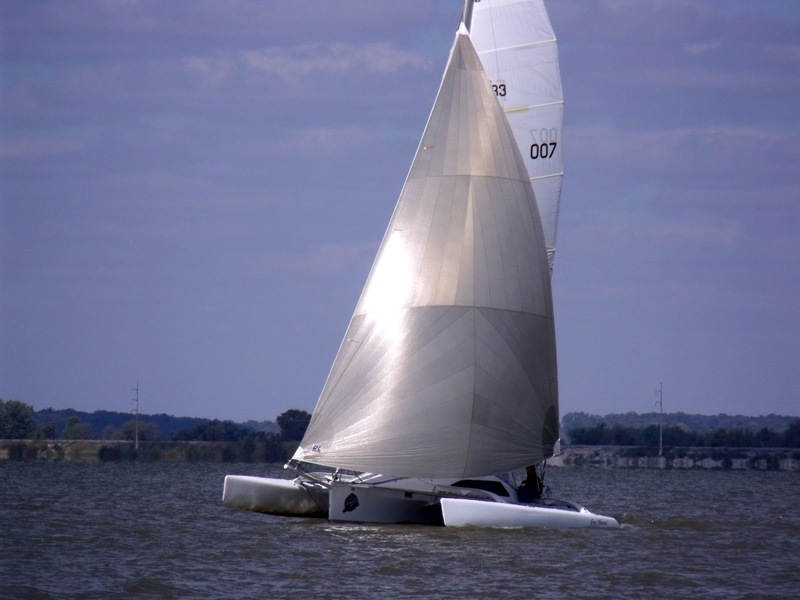 Wide-spaced catamaran hulls, very low center of gravity, and aerodynamic hull shape, contribute to greater stability in strong crosswinds and beam seas. SkeeterCat 33 doesn’t roll like the traditional deep “V” and round bottom vessels with high freeboard and flat vertical cabin structure. Sleek, rounded aerodynamic shape with less wind/wave resistance, and stiffer structure. Powered by two NEW 2015 Honda 50hp outboard engines with the latest Multi-port fuelinjection system and a 5-year warranty. Engines are optimized to run at 4000 rpm cruising speed with Honda’s exclusive BLASTTechnology (boost low speed torque), which means quieter operation, better fuel economyand longer engine life. Natural air cooling/ventilating system. No salt water intake. Less expensive, lowmaintenance. Safe, comfortable cockpit with table seating for 8, good air ventilation. Bimini top can belowered and lock onto the windshield in foul weather. Two private cabins with twin bunks and built-in, screened, 12″ eight-bladed, 3-speed,12-volt ventilation fans (no A/C needed!). Two stern cabin windows, two cabin ports, and two bow air scoops that are weather-proofand can be left open even during a rainstorm for air circulation. Built-in anchoring system to launch and retrieve anchor from cockpit! Boat can be hauled-out/launched and transported on a trailer towed by a medium-sized SUV!